San Marino is an independent republic enclosed within Italy. It lies near the Adriatic coast in central Italy, between the borders of the Emilia-Romagna and Le Marche regions. The Italian language is spoken, and you don't need a passport to enter the little country. Despite its Italian character, San Marino is very proud of its independent status, which brings in hundreds of tourists and tax-free shoppers every day. It has its own football team, military force and stamps. The town's bus connection with Rimini is proudly labelled 'international service'. San Marino is said to have been founded in the fourth century by the saint of the same name, a Dalmation stone-mason who sought refuge here when fleeing religous persecution. The steep craggy ridge of Monte Titano is certainly a good defensive stronghold. Whatever the truth of its founding, by the Middle Ages there was an autonomous settlement here which grew into one of the little states covering Italy like a patchwork. Through diplomacy, luck and possibly a lack of strategic importance, San Marino alone of Italy's city-states managed to hang onto its independence through the centuries, even opting out when Italy was unified in the nineteenth century. 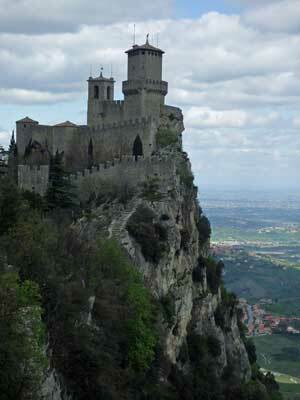 The territory of San Marino spreads for several miles around the capital, which is also called San Marino. There are several other settlements within the republic, some still retaining medieval centres. Unfortunately the land along the main road leading up to the capital is blighted by unattractive modern shopping malls and housing. San Marino the town is what most tourists come to see, though, and it is an impressive citadel. It is high above the coastal plains, with three fortresses perched atop a giddying cliff. Monte Titano is 750m above sea level, so be prepared for winds and a cooler temperature than on the plains below. The most obvious attractions of San Marino are its defensive towers. Two of these (the Rocca and the Torre Cesta) can be visited with a combined ticket and offer good chances to climb towers and explore ramparts. Uncontrolled school-parties can present problems in the confined spaces, but since there is not a great deal to see - views, defences, a few weapons - you can tour the buildings quite briskly. San Marino's fortifications were restored in the 1940s courtesy of Twentieth Century Fox, who used the republic as a film set for Prince of Foxes, starring Tyrone Power. (Apparently the film company rented the entire republic including its population at a daily rate of $40). 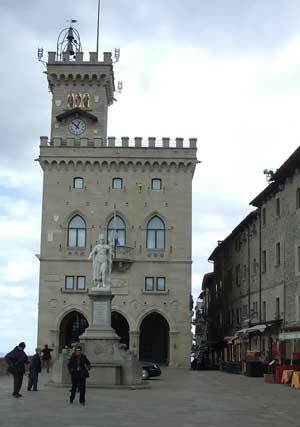 Although its critics describe San Marino, with reason, as a tourist trap, it is possible to escape most of the tour-parties and shoppers by heading out along footpaths towards the hill's remoter crags. There are various woodland routes marked out by rather confusing signs, and if you have time it is worth wandering through the pretty woods, where the natural greenery is such a contrast to the busy streets nearby. For a good short stroll, just head along the main path which follows the clifftop. 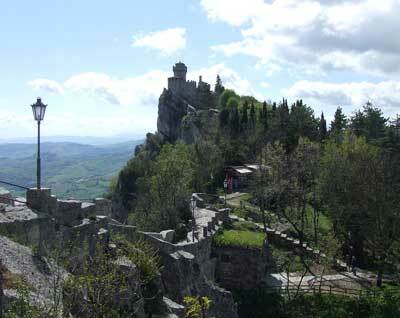 This leads to the third of San Marino's fortresses, a solitary tower called the Torre del Montale. The building isn't open to the public, but it is another great viewpoint and considerably less crowded. Along the way are various picnic spots and stone benches for a spot of peaceful contemplation. More colourful tourist appeal is to be had from the changing of the guard ceremony (at half-past every hour in the summer months) in Piazza della Libertà. The republic's militia are proud of their fancy uniforms. As an independent state, San Marino also has its own stamps and postal system. 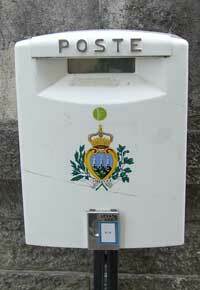 To send a postcard from San Marino, you just need to buy a stamp in one of the town's shops and make sure you post your cards in one of the state's white postboxes before you leave. San Marino's principal museum is the State Museum (Museo di Stato), which contains historical exhibits and artwork. There are also quite a few minor attractions in San Marino, but most are in the take-it-or-leave-it category: museums of torture, waxworks, weaponry. Car-lovers will want to make a detour to the Ferrari museum at the foot of Monte Titano: the Maranello Rosso Collection (closed lunchtimes, open at weekends by appointment - check the website in our links panel). 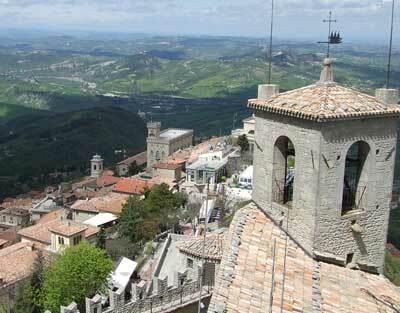 It doesn't take very long to see San Marino, unless you want to visit every museum and shop. The town makes a comfortable short day trip; if you want to explore the other little towns within San Marino allow more time. The town centre is full of places to eat, including some snack and takeaway options. Several of the restaurants have wonderful views and very inviting terraces; even if their fare is squarely aimed at tourists. As in surrounding parts of Italy, the piadina - a kind of flat-bread sandwich - features on most menus. San Marino is a popular shopping destination - particularly with Russian visitors, to judge by the translated shop signs. The historic part of town is full of shops selling duty-free goods like sunglasses, watches, handbags and huge quantities of toy and replica weaponry. Below the citadel, in the sprawling developments along the snaking main road, are large modern shops and malls which can be reached by bus or by car. San Marino is only a few miles from the Adriatic coast; its principal transport connections (a main road and a bus service) are with the seaside resort Rimini, around 15 miles away. The nearest airport to San Marino is in Rimini (the Aeroporto Internazionale Federico Fellini di Rimini-San Marino), and has budget flights from the UK operated by Ryanair. The airport is connected with Rimini railway station by an urban bus service. Other nearby airports are Bologna and Forli. If you're not staying in San Marino itself, Rimini is the best base for visiting the little republic. There are regular bus services from Rimini's railway station, operated by firms called Bonelli and Benedettini. In summer months there are additional services from the seaside part of Rimini. Timetable information and tickets are available from the little bus ticket kiosk outside Rimini railway station; the bus (at the time of writing) leaves from the far side of the road, from a clearly marked stop with a timetable on display. The journey from Rimini takes around 45 minutes, and the bus stops at several points in the modern 'shopping' districts of San Marino before climbing up to its terminus just below the city walls. A funicular connects San Marino town with Borgo Maggiore, a settlement lower down the slopes of Monte Titano. There are several fee-charging car parks in the little country for the tourists who are so important to its economy. There are also facilities for camper vans, some free of charge. If you are touring the area by car, you could combine San Marino with other interesting small towns, such as San Leo or Verucchio, or with seaside resorts like Rimini, Cattolica or Pesaro.